Specialist liquid for everyday use in order to maintain healthy gums and to minimise the frequency and intensity of gum disorders. Suitable for oral cavity inflammations. The proper composition of essential oils kills bacteria responsible for inflammations in the oral cavity and helps maintain normal bacterial flora. Such effects are ensured by the natural mint, thyme, eucalyptus, and sage essential oils and their components: eucalyptol, thymol, and menthol. 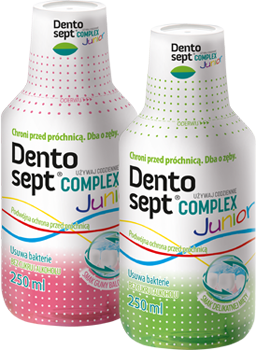 Dentosept Complex provides double protection against caries. Sodium fluoride creates a layer on the surface of teeth to reduce the effects of acids. It prevents demineralisation and boosts the mineralisation of dental tissue. Besides, sodium fluoride restricts the growth of caries-causing bacteria and thus reduces the risk of caries. Xylitol, on the other hand, hampers the metabolism of bacteria and formation of acids that are directly responsible for tooth enamel erosion. Water, xylitol, glycerine, Cremophor EL, Poloxamer 407, mint oil, thyme oil, eucalyptus oil, sage oil, eucalyptol, menthol, thymol, sodium fluoride, flavouring, citric acid, Aseptina M, Aseptina P, CI 42051, CI 47005. Do not dilute or swallow. Do not rinse your mouth with water immediately after using the product.